Since I don't have Netflix nor cable, I wasn't able to catch the series finale until last night (April 1st). To be honest, I was a bit (or a lot) apprehensive about watching it. First of all, I just didn't want to face the fact that my favourite (American) show of all time was coming to an end and secondly, from the reactions I saw on the internet, I was scared about being thoroughly disappointed. And was I? Both yes and no. 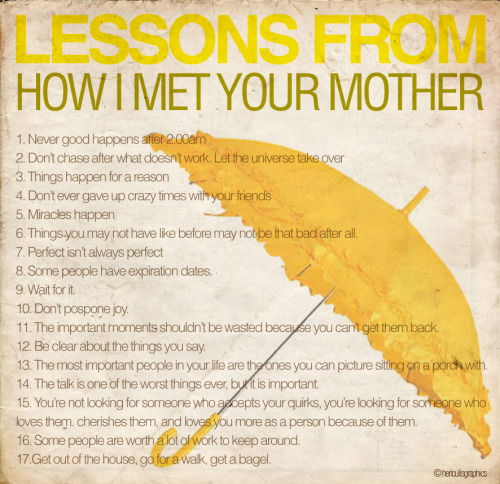 Sure, initially I did not like the fact that the mother dies, that Barney and Robin divorce, that a lot of questions go unanswered, that Ted and Robin end up together (or at least we assume), but after a night of digestion I feel like though the last episode was not as big of a bang as I had hoped, it offered a very slow satisfaction. To be honest, I DON'T think Ted and Robin should be together. If Ted isn't with the Tracy, then he should have ended up with Victoria. IMO at least, Ted and Victoria are far more compatible and besides, Victoria would be able to satisfy Ted's dorky romantic side far better than Robin would. Then back to Robin and Barney, the fact that Robin and Barney split because Robin's job forces them to move all across the world just doesn't resonate with me. 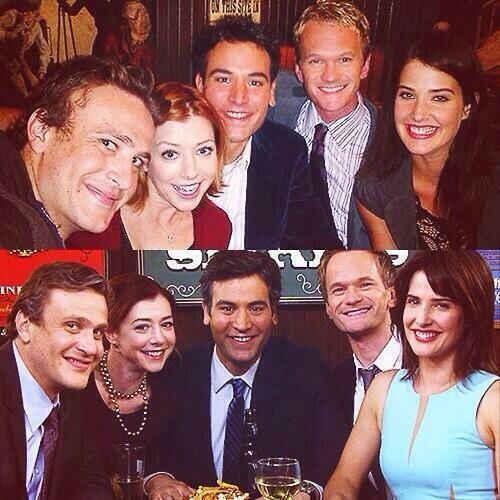 After all, Barney lives for this kind of adventure. Isn't this the legendary life that he is always going on about? I know a lot of people are upset that Tracy dies, but while showering this morning, I realized that it was sort of necessary. After all, the love of her life was already dead as well. And yes, while she and Ted are wonderful together Ted is still not her former boyfriend and so, the situation replays itself: Tracy let go of her ex to be happy again with Ted and now Ted must let go of her to be happy again with Robin. I guess that's why I was satisfied with the ending.